In celebration of the International Children's Day, below are 12 children who made history for being child prodigies. Kim Ung-Yong - Korean; attended Hanyang University from the age of 3 until he was 6; invited to America by NASA at the age of 7; earned his Ph.D in physics at Colorado State University at age 15; world's highest IQ and recognized by the Guinness Book of World Records. Gregory Smith - American; nominated for a Nobel Peace Prize at age 12; founder of International Youth Advocates which is an organization that promotes principles of peace and understanding among young people throughout the world. Akrit Jaswal - Indian; has been called "the world's smartest boy"; also known as the "Seven Year-Old Surgeon"; performed his first medical procedure at his family home in 2000; the youngest student ever accepted by an Indian University, Chandigarh College, at the age of seven. Cleopatra Stratan - Moldovan-Romanian; a 3-year old singer who earns 1000€ per song; youngest person ever to score commercial success as a singer with her 2006 album La vârsta de trei ani. Aelita Andre - Australian; the 2-year-old artist who showed her paintings in a famous Gallery, the Brunswick Street Gallery in Melbourne's Fitzroy. Saul Aaron Kripke - Jewish American; invited to apply for a teaching post at Harvard while still in high school; awarded the Schock Prize, philosophy's equivalent of the Nobel; considered to be the world's greatest living philosopher. Michael Kevin Kearney - American; earned his first degree at age 10 and became a reality show Millionaire in 2008 by winning $1,000,000 on the television game show "Who Wants to be a Millionaire?". Fabiano Luigi Caruana - Italian-American; a chess prodigy who became the youngest Grandmaster at age 14 in 2007. Willie Mosconi - American; nicknamed "Mr. Pocket Billiards"; played professional Billiards at age 6; the juvenile straight pool champion and was regularly holding trick shot exhibitions at the tender age of eleven in 1924; still holds the officially recognized straight pool high run record of 526 consecutive balls. Elaina Smith - British; youngest local radio adviser at Mercia FM in Coventry, West Midlands at aged 7. Ainan Celeste Cawley – Malaysian; was just six years old when he gave a Science lecture about acid and alkaloids at a Singapore school; was only seven years old when he passed the Chemistry O level exam which is a test meant for teens aged 16 and up; enrolled in the Singapore Polytechnic and became the world’s youngest student ever to take up a third-year tertiary module. Elise Tan Roberts – British; Mensa Master at the age of 2 by scoring 141 at the Stanford-Binet IQ test beating the record previously held by a three-year-old boy. A little background about today's celebration, International Children's Day. 1 June 1925 was proclaimed as the International Children's Day by the World Conference for the Well-being of Children in Geneva, Switzerland. A major variant is the Universal Children's Day established in 20 November 1954 by the United Nations. On 22 November 1949, the Moscow congress on Women's International Democratic Federation established 1 June 1950 as the International Day for Protection of Children. The exact date of Children's Day varies in many places around the world. 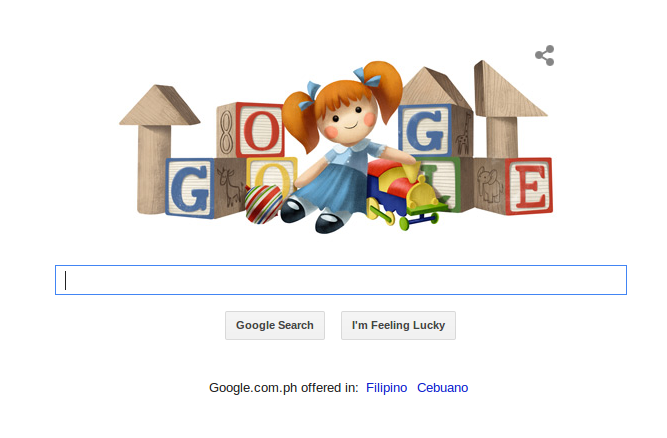 Screenshot of Google's Doodle for Children's Day, doodle with blocks, a doll and other toys, with the blocks spelling out the word "Google."